GARDENA — Dai Ichi Bonsai Kai announces a bonsai demonstration with Ted Matson on Friday, June 15, at 7 p.m. at the Ken Nakaoka Community Center, 1670 W. 162nd St., Gardena. Matson is a popular figure in the bonsai community around California and beyond. He is currently The Huntington’s bonsai curator and is responsible for maintaining the Golden State Bonsai Federation’s bonsai collection. With the help of bonsai volunteers and local bonsai masters, his efforts as bonsai curator have created a “wow factor” for visitors getting their first glimpse of bonsai at The Huntington. He started in bonsai around 1979, and as the years passed by, he progressed from student to teacher with the encouragement of Melba Tucker. Some of his past bonsai teachers were John Boyce, Ben Suzuki, Shig Nagatoshi, Roy Nagatoshi, Warren Hill, and John Naka. Matson has conducted bonsai programs, workshops, and critiques at bonsai clubs, conventions, and conferences. He has appeared as a bonsai headliner and or featured bonsai artist at several major bonsai events. He is a member of several bonsai clubs in California, and served as president of Descanso Bonsai Society and Shohin Bonsai Society. 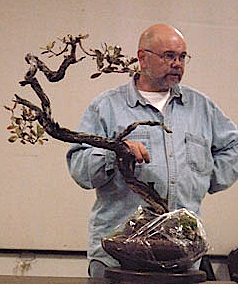 His primary goal in his lectures and demonstrations is to encourage others to improve upon their own creative abilities in design and styling techniques of bonsai.